« MARCH, Celebrate Spring Planting! 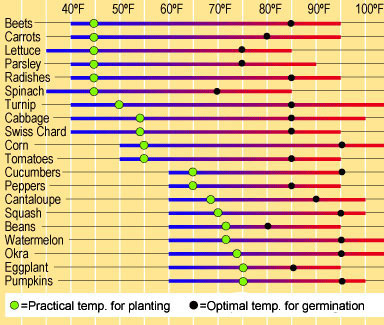 Soil temp is always your basic seed planting time guide! 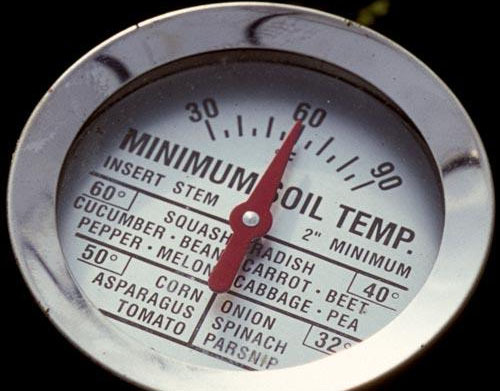 There are minimum germination temps, ideal temps and max temps. Plant when soils reach minimum temperature measured at 8 a.m., 4 inches deep. Beans are an exception, being measured at 6 inches deep. 40 Degrees! Crops that germinate in the coolest soils: arugula, beets, broccoli, carrots, cauliflower, fava beans, kale, kohlrabi, leeks, lettuce, pak choi, onions, parsley, parsnips, peas, radicchio, radish and spinach seed. 50 Degrees: Cabbage, Chinese cabbage, leeks, onions, Swiss chard, and turnips. 60 Degrees warm-season vegetables: beans, beets, broccoli, Brussels sprouts, cabbage, carrots and cauliflower. 70 Degrees heat lovers! Beans, corn, cucumbers, eggplants, melons, okra, peppers, squash, and tomatoes. In northern climates it can take several weeks for tomatoes, eggplant and peppers to germinate in the garden. You can get a jump on the season if you do cold-tolerant, or if North, short-season variety transplants. Squash, cucumbers and corn grow quickly and are easy to start from seed. Heat your soil with plastic mulch and use a cloche, fabric row cover or cold frame. The bane of early planting is a late hard freeze. If you decide to take an early season chance, have covers handy for unprotected plants! We can thank Dr Jerry Parsons, Extension Horticulturist at the Texas Agricultural Extension Service, for the temps info in this great chart below! You see, there are minimum temps, optimum, and no-go temps! At the practical temps you might not get 100% germination, but you will get a crop at the right time. Too soon you get too little. Too late, like in SW desert areas or hot climates, there may be too much summer heat and little production, high water costs. Notice that there are differences from the temps and plants listed above and the chart below, some plants appear in two temps, and some plants, like okra, might not be planted in the north at all! Dr Parsons has longer Texas heat in his area. Northern gardeners need to plant sooner for short cooler summers. Plant cold tolerant or early varieties. And, plant more seeds to compensate for those that don’t germinate. Or, presprout for more surety. Regions have huge variances in planting time strategies, and even in the same yard there are micro niches that vary considerably, so get a thermometer and plant in the right place at the right time! Start with fresh viable seed for great germination, and don’t forget your seed soaking & presprouting options! With a Soil Thermometer and good gardener self discipline, get your seeds and plants in the ground at their most productive times for your location! Here’s to abundant harvests! How (more) glad did it make me that I have a greenhouse! Thanks, Paula! Yes, let’s hear it for greenhouses! Happy Spring!